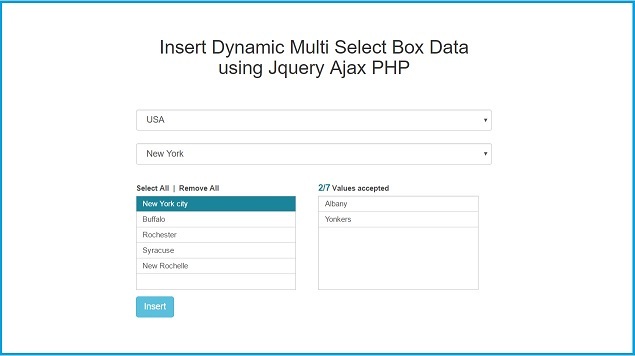 In this tutorial we are going to learn how to insert multiple select box data into mysql table by using Ajax jquery with php. In this post we will make stylish multi select box with easy to use user interface, so for this we have use Jquery plugin light weight multi select, by using this light weight jquery plugin we can converts multi select box into two different selection box, when we have click on particular option of left select box then that value will be append into right select box and suppose we want to remove value from right select box then we have simply click on particular option that value will be removed from right box to left. This type of user interface we should use if we have multiple option select and from this interface we can easily understand which option we have select and which are left for selecting. We will make simple dynamic dropdown list box for insert country state and multiple city data into table, from country and state drop down box we can select single data but from city multi select we can select multiple city at the same time. And lastly all select box data has been dependent on it's parent select box. That means city data depend on state selection and state data depend on country selection. In short all dropdown list are dynamic dependent. If we want to select with multiple item from single select box and this plugin is light weight and it is easy to use. If we have go to user interface wise it is easy to understand to user which option he has select from select box, but this plugin has one draw back is that it is not responsive. So here we have discuss how to insert multi select box data by using light weight multi select jquery plugin with Ajax and PHP.